It is our department’s tradition to bring in a dessert to share on our birthday. It works well because, on your birthday, you always get something you like, nobody else has to collect money from coworkers to pay for it, and if you don’t get a birthday treat, you only have yourself to blame for forgetting. I worked from home on my birthday yesterday, but next week I hope to bring in something chocolatey to celebrate. In honor of chocolate mousse cake, here is an article about mousse and moose! Moose and mousse are two words that are pronounced in the same manner but are spelled differently and have different meanings, which makes them homophones. We will examine the definitions of moose and mousse, where these words came from and some examples of their use in sentences. A moose is a large animal with antlers that is found in the northern forests of America, Europe, and Asia. It is of the deer family. The plural form is moose, not mooses or meese. The word moose is derived from the Algonquian language, probably from the Eastern Abnaki word, mos. A mousse is a culinary dish that is whipped with egg white and cream, making it light and smooth. 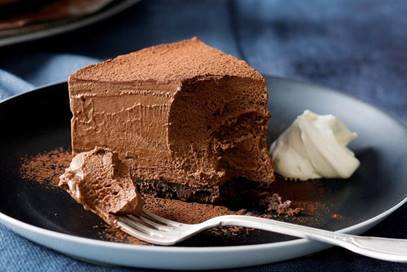 Mousse may be sweet or savory, served as a side dish, main dish or dessert. Today, the term mousse is often applied to makeup and hair products. The word mousse is a borrowed or loan word, taken from the Old French mousse meaning froth. Borrowed words and loan words are terms that have been taken from other languages and used as English words and phrases. Moussaka is a delicious Greek dish made with eggplant, but that’s for another day. « Editor’s Corner: Between or Among?